In September last year, our Research Officer, Rosa, began part-time training to become a Genetic Counsellor. Hear from Rosa about what led her into the profession and how she feels this will complement her role here at Genetic Alliance UK. After finishing my degree in Biological Sciences, I went on to do a Masters of Research (MRes), focusing on Psychiatric Genetic Counselling. 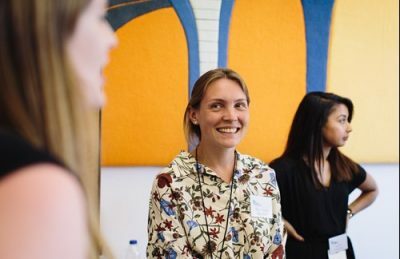 This looked at providing Genetic Counselling for individuals and family members of people with conditions like schizophrenia, bipolar disorder, and depression. I learned a lot about the Genetic Counselling profession, and was able to meet many genetic counsellors and geneticists at courses and conferences. This was the moment I knew I wanted to be a genetic counsellor! The Mental Health Project, which is looking at the impact that living with a rare or undiagnosed condition can have on wellbeing and mental health. 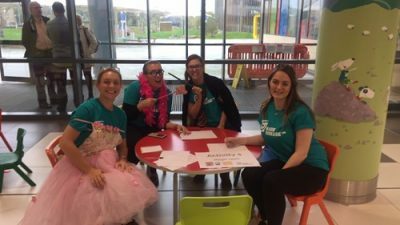 The Children and Young People’s Project, which aims to help us understand more about what living with a rare or undiagnosed condition can mean for children and siblings – from their perspective. There hasn’t been much research like this before, and it’s a really interesting and rewarding project to be involved in…with plenty of fancy dress opportunities! To become a Genetic Counsellor, you have to complete an accredited Masters course, grounding you in the skills you need to practice. This year, I started a Masters (MSc) in Genetic and Genomic Counselling at Cardiff University; a 3-year, part-time course. This means I can continue to work at Genetic Alliance UK until I become a trainee Genetic Counsellor, which I’m so pleased about! Often people think genetic counselling is mainly about giving information to patients, or talking about risks or genetic testing. And these things absolutely can be part of genetic counselling, but it can also be so much more. Genetic counselling is about helping people adjust to a genetic condition, or their risk of a condition, in a way that really means something to them as an individual. For example, often having a genetic condition can trigger lots of different emotions. Feelings like guilt, worry, grief, anger and uncertainty are very common, and can have huge implications for individuals and families. The genetic counsellor provides support to help people explore and work to address these emotions, and can also signpost to other support services that might be helpful, like peer support groups such as SWAN UK, or psychological support services. Sometimes genetic counselling can also involve decision-making. This might be around reproductive options, for example, or about whether or not a patient wants to undergo genetic testing. These decisions are very personal – so what’s right for one person might not be right for the next. The genetic counsellor supports people to make the choice that is best for them. How did you find out about the genetic counselling profession? I’d heard about Genetic Counselling during my degree, but I didn’t really know much about it. It was only when my university supervisor suggested the MRes in Psychiatric Genetic Counselling that I became really interested. I did an internet search that evening and thought – this is what I want to do! And it’s been all-go from there. I was very lucky to have the opportunity to study Genetic Counselling specifically. 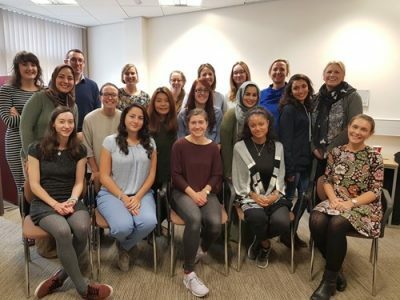 The highlight of the MRes was travelling to Vancouver to visit their specialist Psychiatric Genetic Counselling Clinic, where I spent time with their clinical and research teams, and learned more about the day-to-day life of a Genetic Counsellor. I got to see for the first time what a positive impact you can have on people’s lives as a Genetic Counsellor – I can even remember the first appointments I sat in on. I think that’s a memory that will stay with me forever. Of course, I have also learned a lot through my work here at Genetic Alliance UK, which has given me a much greater understanding of what living with a genetic, rare or undiagnosed condition can mean, from the view of patients and families, many of whom have been seen by clinical genetics and have had genetic counselling. What drew you to want to become a Genetic Counsellor? It draws on both genetics and psychology, which I find really interesting. It’s also a super exciting time to be in the field right now, as we’re in the so-called ‘genomics’ era. This means our understanding of genetics is growing rapidly – clinically we’re playing catch up! Because of this, there are lots of changes happening in clinical genetics, and new challenges and questions that we have to try and address. It’s really fascinating. More than anything, you get to make a real difference to people’s lives. You might see patients and families at a very testing time for them emotionally, or when they have big decisions to make. Genetic counsellors can use their knowledge and skills to really help them. I think it’s such a privilege to be able to take on that role, and it makes for such a rewarding and fulfilling career. Is there a specific field of genetic counselling you would like to specialise in? Since joining Genetic Alliance UK I have become very interested in genetic counselling for ultra-rare conditions, as often receiving an ultra-rare diagnosis can present lots of additional challenges for patients and families. With projects like the 100,000 Genomes Project, a lot of patients and families are finally getting a genetic diagnosis, but often it is very rare and poorly understood, sometimes raising even more questions for people. As our knowledge increases, more patients and families will find themselves in this position and clinically we’ll have to work really hard to make sure that people are getting the information and support that they need. Do you think the training will aid your role here at Genetic Alliance UK? It’s very much a two-way thing! My work here gives me so much valuable insight that I can apply to my training. From talking to patients and families, I’ve gained a much better understanding of what it can mean to not have a diagnosis, the difficulties in navigating the social care system, and the importance of accessing peer support and emotional support. I also find it really helpful to learn about healthcare policy that’s relevant to genetics, such as our work on the UK Strategy for Rare Diseases. Likewise, my training has already started to help my role here at Genetic Alliance UK. I’ve started learning more about our healthcare system and the way clinical genetics departments work within the UK. I’m also learning more about certain genetic conditions and about the emotional impact of genetic conditions, for instance, which is especially helpful as my role involves speaking to lots of patients and families. And of course, I will also meet geneticists and genetic counsellors, so I’ll be able to keep up-to-date with the latest developments and get the chance to learn from leading healthcare professionals in the field. I feel really lucky to have a job that compliments the training so well, and I know my work here will make me an even better genetic counsellor in the future! If you have any questions about this guest blog, please email Rosa. You can also find out how to access genetic testing/ counselling here.